This is a little flower that can be used to do paper tearing. It is great to tear colored construction paper and glue it onto the flower to make a pretty colorful flower while improving fine motor skills. 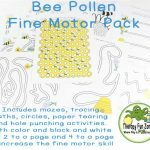 This is a free file that is part of the big pack of bee pollen fine motor activities.